Jamille Records is back with a new, limited 7" release of ultra-rare, midwest hip-hop. This time around it's a split 7" single, with a joint from the 90's on the A-side, and an 80's track on the flip. And, like I've mentioned in previous posts on Jamille releases, they've got a tradition of dropping super rarities alongside completely unreleased material, and once again they've done both. Let's start with the 90's. 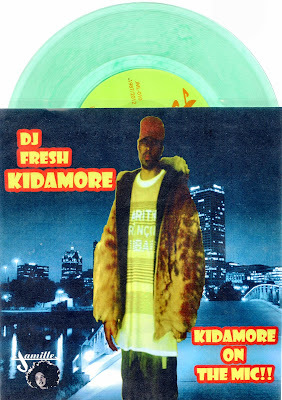 We've got a DJ Fresh Kidamore solo joint called "Kidamore On the Mic" from 1994. Kidamore was down with the Ill Chief Rockers collective that've had a couple joints repressed through Jamille already. He produced "Lamont Is the Baddest" on the Kid Crab & G.F.C. 7", and did some scratching on the "Jealous" single. Those were all 80's joints, so this one's from a later phase in his career, and I gotta say... it's not as compelling. Not because it's newer (lord knows, there's plenty '94-era material I'd bust a gut for); this just feels under-produced, with Kidamore kicking some generic rhymes over the "Big Poppa" instrumental. And he's no Biggie Smalls, Honestly, that's never a good comparison to invite on yourself. The only element really worth getting excited about are the new cuts he laces over the track - he's quite nice on the tables, and those parts sound really fresh. But they're not enough to carry the full song when they're stuck playing a supporting role to blah rhymes, a lame hook and a beat every single one of us already have in our collections. Certainly, it's good to see any extra little piece of history like this preserved, and this is the first time the song is ever being released. But frankly, this feels like mixtape filler to me. Not wack - the cuts really are impressive and worth the listen... I'd love to hear him flex his (DJ) skills on more projects. But "Kidamore On the Mic" just isn't the sort of joint you'd feel compelled to seek out on vinyl on its own. Fortunately it's not on its own, and the flip side more than justifies your purchase all by itself. "DJ Politician" by Rap Master B and DJ E.Z. D is a lot of fun. It's really raw - perhaps too raw, as it really doesn't sound professionally mixed or recorded, but that kinda just adds to the throwback feel. And the song is so engaging, that you'll get over any initial misgivings as it pulls you in. B provides the big, big beat and wild rhymes about his DJ using one wild presidential reference after another. I'm not sure I know enough American history to truly appreciate what it means to be "the Harry Truman of mix economics," for example. But I know there's plenty of scratches being showcased here, and that's enough for me. They're not as artful as Kidamore's, but they work really well within the context of a song that's already quite a good time. This one originates from a rare 12" from 1987 on Ice World Records, which had a couple other songs on it. I've never heard it. In fact, I'd never even heard of Rap Master B before. I only know about the original 12" because I found this listing in a search. But this definitely has me wondering what those other cuts are like.